Hey there! Did you have a nice weekend? Mine was so. much. fun. I did a girl’s trip to Hershey PA. We went to the spa, drank chocolate martinis, and sat around gabbing for 2 straight days. It was the best! I get invited to all the most fun things, because I always bring yummy treats. For this trip I brought cinnamon rolls, peanut butter chocolate chip cookies, homemade croissants with raspberry jam, and this chocolate cheesecake. Suffice it to say, I do think I will be invited back. Every tummy was full and every beautiful face was smiling. To make this creamy-dreamy, decadent dessert, start by mixing cream cheese, sugar, cocoa, and a little salt together in a large mixing bowl. It should only take a minute or two until these ingredients are smooth and well-combined. Then, scrape the bottom and sides of the bowl with a silicone spatula, and mix in the first egg. For smooth, lump-free cheesecake, it’s really important to stir in the eggs one at a time, scraping the bowl after each addition. I have a beater with a silicone edge on it, so when you watch me making it in the video below, you won’t see me scraping every time. But if you don’t have this kind of attachment, you’ll definitely want to do that! Once the eggs are in, you can add the yolks, melted chocolate, and vanilla. Just pour this luscious concoction over your crunchy cookie crust. I chose to do an Oreo crust, but a graham cracker crust or vanilla wafer crust would work really well too! Once you’ve transferred the batter to the pan, place the whole thing in a larger baking dish, and pour hot water all around. The hot water should come at least halfway up the sides of the cheesecake pan. This is called a “water bath,” or “bain marie,” and it really helps to cook the cheesecake gently and avoid it cracking. Bake it for 20 minutes at 350 degrees F, then turn the oven temperature down to 250 degrees F, and check it after another 60 to 65 minutes. It should be fully set around the edges, and just the teensiest bit wobbly towards the center. When it reaches that point, turn off the oven, leave the door slightly ajar, and let it cool in there for an hour or so. Then remove it from the oven and let it come to room temperature. Chill it in the fridge for at least two hours (or preferably overnight) before slicing in. I have strong opinions on this matter! Read on. My top choice for baking cheesecakes is always going to be an 8-inch diameter round cake pan. I know it sounds crazy, but this is how I always did it in my professional pastry chef days, and I promise it works! I love this type of pan because it gives you a cheesecake that’s slightly taller. And it never leaks! The crust always comes out nice and crunchy, and that is such a lovely contrast with the smooth, creamy filling. As long as the cheesecake is well chilled, it should come out of the pan easily. Just turn it out onto a piece of parchment, then flip it right-side-up onto the serving plate. If you find it difficult to remove from the pan, it’s probably just because the butter in the crust has hardened from being in the fridge. Run a thin knife around the edge, wrap it in a hot towel or run it (quickly!) over a low flame on your stove to soften the butter, and it should slide right out. Springform pans really are not my jam, for cheesecakes anyway. I always recommend baking a cheesecake in a water bath (aka: bain marie) to prevent cracking (more on that below), and with a springform pan they just ALWAYS leak. Even if they’re wrapped in foil I still have this problem. And a crunchy crust is so much better than a soggy one! But if you really prefer a springform, then you do you. It’s not my cup of tea, but maybe you have some trick that always works for you. So go for it! Just be aware that springform pans are often larger (9- or 10-inches in diameter), and therefore may require some adjustment to the bake time. 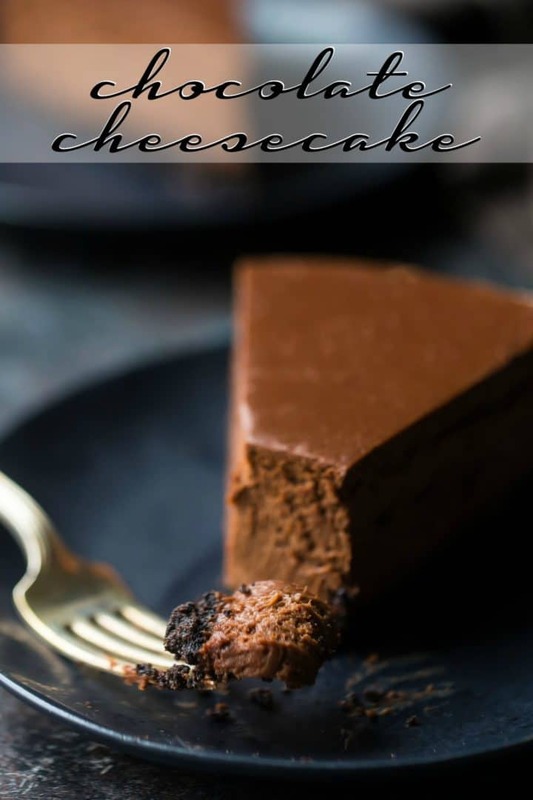 You can use an 8×8-inch or 9×9-inch baking pan for this recipe too, and that will give you cheesecake bars rather than a round cake. Again, just keep an eye on the bake time, because a bigger, thinner cheesecake may need less time in the oven than a smaller, taller cheesecake would. 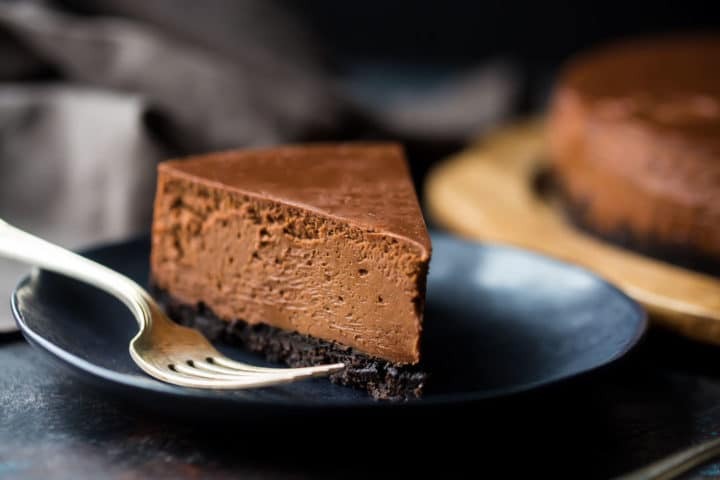 The filling for this is already gluten-free, but if you want to make a completely gluten-free chocolate cheesecake, just substitute the Oreos in the crust for a gluten-free chocolate sandwich cookie. Don’t beat too much air into the batter. Cook it in a water bath. Allow it to cool slowly too- at first in the oven, then at room temperature, and finally, in the refrigerator. All of these tips should guarantee your cheesecake will be beautifully smooth on top, and free of ugly cracks! CAN THIS RECIPE BE MADE WITH WHITE CHOCOLATE? You can definitely sub out the bittersweet chocolate for white. Use the same amount of white chocolate in place of the bittersweet, and sub out the cocoa powder for 3 tablespoons of cornstarch. And be sure to keep an eye on the bake time! These substitutions may require a slightly longer bake. You’ll know your white chocolate cheesecake is done when it’s set around the edges but still just a teeny bit wobbly towards the center. Side note: either white or regular chocolate cheesecake would be fantastic with a little raspberry coulis! Pop about 2 cups of raspberries (fresh or frozen) into a little pot along with 1/4 cup of sugar. Simmer over low heat for about 15 minutes or until syrupy, then pass through a fine mesh sieve to strain out the seeds. Voila! Cheesecake is a perfect make-ahead dessert! To really do it well, it’s actually best to allow lots of extra time. Let it cool s-l-o-w-l-y, to avoid any cracks in the top. And for really clean, beautiful slices, I like to give it an overnight in the fridge. CAN CHOCOLATE CHEESECAKE BE FROZEN? Cheesecake freezes very well! Just wrap it tightly in plastic wrap so it doesn’t pick up any funky freezer odors. It might be a good idea to slip it into a zip-top bag as well! HOW LONG DOES CHOCOLATE CHEESECAKE LAST? You should be able to leave this cheesecake out at room temperature for a day or two, without a problem. It’s really nice and extra-creamy when it’s served at room temperature. If you need to store any leftovers, they should keep in the fridge for at least a week, or in the freezer for a month or more. Just be sure to wrap everything up nice and tight, so it doesn’t get dried out. 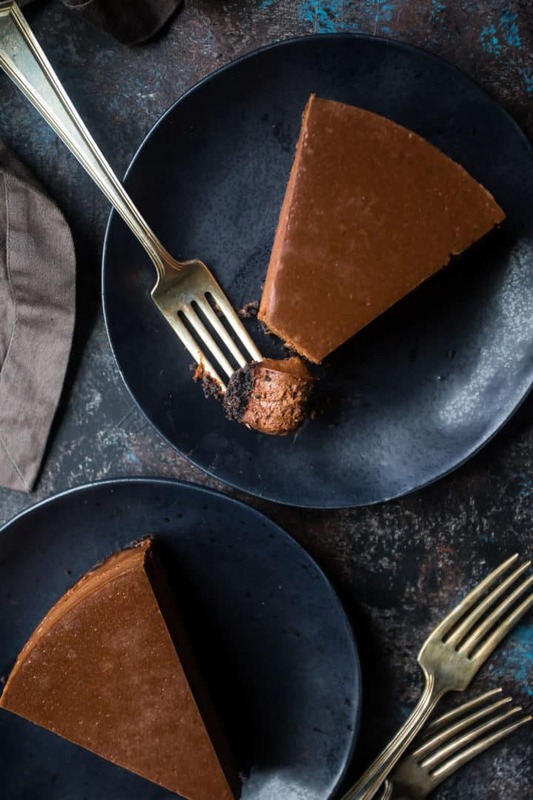 If you’re craving something rich and decadent, this chocolate cheesecake recipe has got your name all over it! So creamy, smooth, and rich, with so much deep chocolate flavor. Give it a try and let me know how you like it! Mist an 8-inch diameter by 3-inch high round cake pan with non-stick pray and line with a circle cut from parchment paper. Place the cookies in the bowl of a food processor and process until fine. Drizzle in the melted butter and process together until combined. Place the cream cheese, sugar, cocoa, and salt in a large mixing bowl and mix on medium-low speed until smooth. Scrape the bottom and sides of the bowl with a silicone spatula, and stir in the yolks, cream, melted chocolate, and vanilla. Pour the batter over the prepared crust, place the cake pan in a larger baking dish, and pour water into the larger dish until it comes halfway up the sides of the pan. 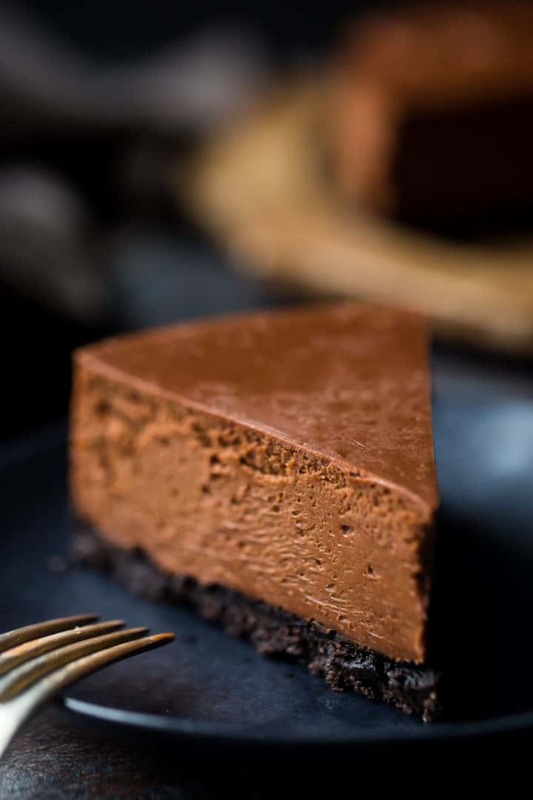 Bake the chocolate cheesecake for 20 minutes at 350 degrees F, then lower the oven temperature to 250 degrees F and bake for another 60 to 65 minutes, or until set around the edges but still slightly wobbly towards the center. Turn off the oven and prop the door open with a wooden spoon. Allow the cheesecake to cool slowly in the oven for at least an hour. Allow the cheesecake to come to room temperature, then chill it in the refrigerator for at least 2 hours (or preferably overnight). This is one of our fav cheesecake recipes! It looks very delicious and I would like to try that. Mam, 24 ounces of cream cheese, can you pls provide to me in cup measurement? 4 ounces of bittersweet chocolate is equal to 1/2 cup I’m I, right? Pls advice. Thanks a lot, mam. 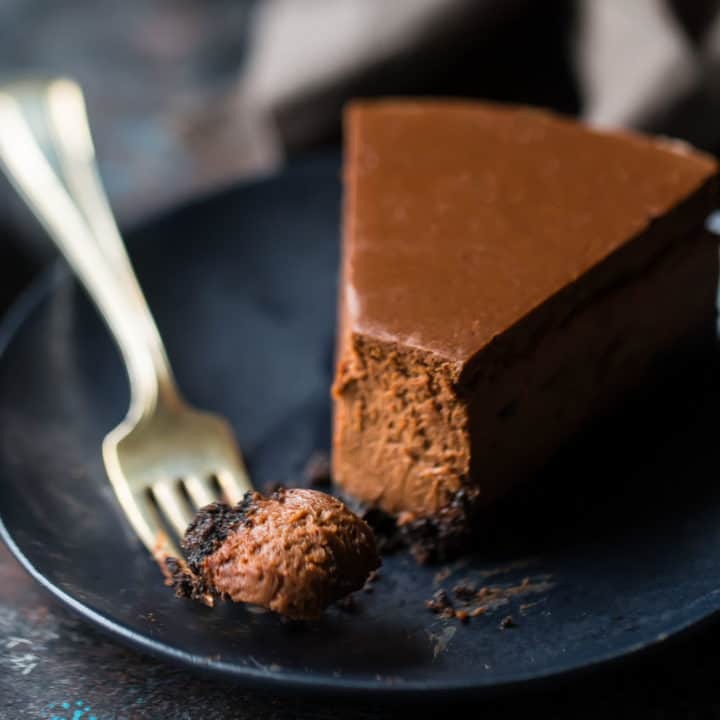 You can never go wrong with a decadent dessert like this chocolate cheesecake! It looks heavenly!